My favorite time of year is coming. Time to craft with my favorite animal for one of my favorite craft shop - Dare 2B Artzy! I used the Dare 2B Artzy Holly Days Collection Paper Pack. I love the collection of patterns! The background paper is so fun. No need to add a sentiment (unless you want to!). 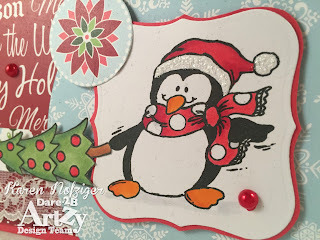 The adorable penguin and tree are from the Dare 2B Artzy Penguin Fun stamps. Here's a close-up where you can see that I added some Frosted Lace Stickles to make that hat's fur a little more fluffy! Terrific card! Love your use of the Dare 2B Artzy patterned papers! Fantastic Holiday Card! I adore Penguins..